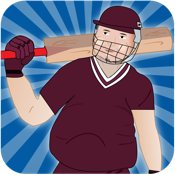 Welcome to the most challenging cricket game on iOS. This game is designed to make sure that you do NOT hit 6 sixes in an over. Not that easily, anyways. Batting as a single batsman, you help your team chase down scores against a gallery of brutish bowlers. Battle your way through googlies, doosras, in-swingers, out-swingers, yorkers and a host of other fiendish tricks. The game even lets you pace your innings – you can defend or attack, hit sixes, take singles or rotate strike. 1) Four levels of run chases - from 3 to 20 overs. Level 1 (3 overs) is unlocked by default. As you win games more levels get unlocked for free. 2) Practice mode to get your timing right. After all, batting is all about timing. 3) Two modes of play - an Easy mode to get started and, for the experts, a tougher level with 3-over run chases. Better still, you take to the crease in the irresistible form of the one and only “Fat Batsman”. A paid-for Pro version lets you do away with the ads, and unlocks all 4 levels for you straight away. So what are you waiting for? It’s time to start batting.